Ponca City was created in 1893 as "New Ponca" after the United States opened the Cherokee Outlet for European-American settlement during the Cherokee Strip land run, the largest land run in United States history. The site for Ponca City was selected for its proximity to the Arkansas River and the presence of a fresh water spring near the river. The city was laid out by Burton Barnes, who drew up the first survey of the city and sold certificates for the lots he had surveyed. After the drawing for lots in the city was completed, Barnes was elected the city's first mayor. Another city, Cross, vied with Ponca City to become the leading city in the area. After the Atchison, Topeka and Santa Fe Railway had opened a station in Cross, people thought it would not open another in Ponca City because of the two cities' proximity. New Ponca boosters eventually secured a station after offering the Santa Fe station agent two town lots and the free relocation of his house from Cross. Ponca City reportedly obtained its first boxcar station by some Ponca City supporters going to Cross and returning with the town's station pulled behind them. Cross eventually became defunct, and today, what was once Cross is now a residential district in Ponca City. In 1913 New Ponca changed its name to Ponca City. Ponca City's history and economy has been shaped chiefly by the ebb and flow of the petroleum industry. E. W. Marland, a Pennsylvania oil man, came to Oklahoma and founded the Marland Oil Company, which once controlled approximately 10 percent of the world's oil reserves. He founded the 101 Ranch Oil Company, located on the Miller Brothers 101 Ranch, and drilled his first successful oil well on land which he leased in 1911 from the Ponca Tribe of American Indians. He was elected in 1932 as a U.S. congressman and in 1934 as governor of Oklahoma. Marland's exploitation of oil reserves generated growth and wealth that were previously unimaginable on the Oklahoma prairie, and his company virtually built the city from the ground up. Marland and his associates built mansions to display their new wealth, including the Grand Home and the E.W. Marland Estate (once called the "Palace on the Prairie"). Because of this period of wealth and affluence, Ponca City has a high concentration of buildings that exemplify the popular Spanish Colonial Revival architecture of the period, as well as Art Deco-influenced buildings and homes. The "Roaring 20s" came to an end for Ponca City shortly before the Great Depression. After a successful takeover bid by J.P. Morgan, Jr., son of financier J.P. Morgan, Marland Oil Co. merged with Continental Oil Co. in the late 1920s. It was known as Conoco for more than 70 years. The company maintained its headquarters in Ponca City until 1949 and continued to grow into a global corporation. During the oil boom years of the 1980s, Conoco was owned by the DuPont Corp., which took control of the company in 1981. After nearly two decades of ownership and an oil bust that crippled Oklahoma's economy in the late 1980s, DuPont sold off its Conoco assets in 1998. In 2002, Conoco had merged with Phillips Petroleum (another major petroleum player with roots in northern Oklahoma) to become ConocoPhillips. ConocoPhillips was then the sixth-largest publicly traded oil company in the world, and the third largest in the United States. It maintains a significant presence in its historic home state. Since the company has reduced its workforce and facilities in the city, the population has declined steadily since the early 1990s. In February 2009, ConocoPhillips announced that all of its remaining non-refinery operations in Ponca City (representing 750 jobs) would be moved out of the city. The city's recent efforts to grow its economy beyond the petroleum industry have attracted a number of technology, manufacturing and service jobs. The statue of Standing Bear honors the Ponca chief who successfully argued in U.S. District Court in a landmark civil rights case in 1879 that Native Americans are "persons within the meaning of the law" and have the rights of citizenship. Until recently, European Americans' accounts of their settlement and the growth of the oil industry in Ponca City have often overshadowed both the long ancient history of indigenous peoples in the area, as well as those tribes who were resettled to Oklahoma in the nineteenth century under Indian Removal. Ponca City is named after the Ponca tribe, part of whom were relocated from Nebraska to northern Oklahoma from 1877 to 1880. Like all of the forced American Indian removals of the 19th century, the Poncas' trek was arduous. Followed by the government's failure to provide adequate supplies, as well as malaria at their destination, nearly one-third of the Ponca died from illness and exposure. "Out of 700 Ponca who left the Nebraska reservation, 158 died in Oklahoma within two years." The Ponca protested their conditions. An additional irritant occurred upon the death of Standing Bear's oldest son in 1879. The chief had promised to bury him in his homeland, and about 60 Ponca accompanied him back to Nebraska. The US Army was ordered to arrest them for having left the reservation, and they were confined to Fort Omaha. Most of the tribal members who left eventually returned to the reservation in Oklahoma. With the aid of prominent attorneys working pro bono, Standing Bear filed a writ of habeas corpus challenging his arrest. The case of Standing Bear v. Crook (1879) was a landmark decision in the US District Court, where the judge ruled that Indians had the same legal rights as other United States citizens. The Ponca Nation, which has kept its headquarters south of Ponca City since 1879, played a major part in the development of the Marland Oil Company and the city. Chief White Eagle leased resource-containing portions of the tribe's allotted land to E.W. Marland in 1911 for oil exploration and development. The Ponca City region of Oklahoma is part of "Tornado Alley". Tornadoes are most common in April, May and June. Ponca City faces very hot and humid summers known to average over 100 °F (38 °C) as well as severe storms. During the winters, Ponca City consists of mostly mild to strong winters with snowstorms and ice. Ponca City is home to several landmarks on the National Register of Historic Places including the Poncan Theatre, the Marland Mansion and Marland's Grand Home. Ponca City also holds several regional events each year. The Pioneer Woman statue was modeled by sculptor Bryant Baker and was unveiled in a public ceremony on April 22, 1930, when forty thousand guests came to hear Will Rogers pay tribute to Oklahoma's pioneers. The statue is 27 feet (8.2 m) high and weighs 12,000 pounds. Ponca City is the site of the Pioneer Woman Museum and the Pioneer Woman statue. The statue was erected to commemorate women pioneers. In the early 1920s, E. W. Marland decided to create a statue commemorating the Pioneer Woman. Marland was reportedly asked, "E. W., why don't you have ... a statue to the vanishing American, a Ponca, Otoe, or an Osage - a monument of great size?" Marland answered, "the Indian is not the vanishing American - it's the pioneer woman." He sponsored a competition for the winning statue. The British-born American sculptor Bryant Baker was chosen as the winner. His full-scale work was unveiled in a public ceremony on April 22, 1930. Forty thousand guests came to hear Will Rogers pay tribute to Oklahoma's pioneers. The statue is 27 feet (8.2 m) high and weighs 12,000 pounds. Ponca City Public Schools serves the general population's education requirements. Ponca City Public Schools serves over 5100 students. Ponca City High School (Po-Hi) - serves all 9th through 12th grade students in the school district. Ombudsman Alternative Education Center - had provided select students the option to take a mostly technology-based route through high school. Ombudsman Alternative Education Center was closed after the end year of 2012-2013. WildCat Academy Program - starting in the 2013–2014 year became the new alternative school for high school students in the area. Sponsoring the Ponca City WildCat logo, with new changes from the Ombudsman and past alternative schools. East Middle School - East Middle School serves Ponca City's approximately 380 8th grade students in the Ponca City Public School system. University Center at Ponca City offers interactive television (ITV) classes from several area universities, including Northern Oklahoma College and Northwestern Oklahoma State University. In 2018 the UC began an ambitious project seeking to create STEM opportunities for younger students to encourage a higher education pursuit. In December 2018, Phillips66 awarded the UC an $85,000 grant for the purchase of additional robotics kits and equipment to further develop the UC's STEM initiatives. Ponca City is the headquarters for Oklahoma State University's University Multispectral Laboratory. Ponca City Regional Airport (airport code PNC) (1007 feet above mean sea level) is located at the northwest corner of the city at 36 degrees 43.84 north latitude and 97 degrees 05.99 west longitude. The facility has a 7,201 foot 17-35 runway which is 150 feet (46 m) wide, and the un-towered facility has a full-length taxiway. The local airport booster club hosts a fly-in breakfast every first Saturday of the month, year around, "rain or shine". Bill Pickett's image on a handbill advertising the movie "The Bull-Dogger," released in 1921 by The Norman Film Manufacturing Company. Pickett was billed as "the world's colored champion" in "death-defying feats of courage and skill." A film about E. W. Marland was expected to be in production to shoot in Ponca City, titled The Ends of the Earth. The film was to star the Academy Award winner Jennifer Lawrence. Production was expected to start in 2014. However, as of February, 2019, IMDb continues to list the movie only as "in development." ^ a b c William D. Halsey, ed. (1976). "Ponca City". Collier's Encyclopedia. 19. Macmillan Educational Corporation. p. 236. ^ a b "Geographic Identifiers: 2010 Census Summary File 1 (G001), Ponca City city, Oklahoma". American FactFinder. U.S. Census Bureau. Retrieved April 12, 2019. ^ a b c Louis Seymour Barnes, "The Founding of Ponca City", Chronicles of Oklahoma 35 (Summer 1957). ^ Rod Walton, "750 jobs in Ponca City will move: All ConocoPhillips non-refinery work is leaving town", Tulsa World, February 18, 2009. ^ "The Ponca Trail of Tears: Standing Bear Returns and Is Arrested". The Trial of Standing Bear. Nebraska Studies. Archived from the original on 2011-06-16. Retrieved 2010-09-14. ^ "National Climatic Data Center" (PDF). National Oceanic & Atmospheric Administration. Archived from the original (PDF) on 2014-08-13. Retrieved 2011-02-11. ^ "The Museum". Pioneer Woman Museum. The Pioneer Woman Museum. Archived from the original on 2010-06-18. Retrieved 2010-09-14. 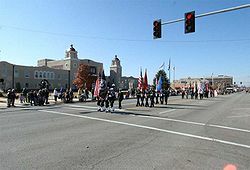 ^ "Ponca City Main Street". ^ "Filming Locations". Twister (1996). Internet Movie Database. Retrieved 2010-09-14. ^ "The Ends of the Earth". IMDb. Retrieved February 27, 2019. ^ NewsOK.com "Video: Oklahoma featured on Starz adaptation of Neil Gaiman's 'American Gods,' premiering Sunday" by Brandy McDowell. April 29, 2017. ^ "List of Gansu's sister cities by 2012". Gansu Province, China. Retrieved 2017-08-25. Wikimedia Commons has media related to Ponca City, Oklahoma.